Chef Hugo Matheson - The Kitchen - Find. Eat. Drink. 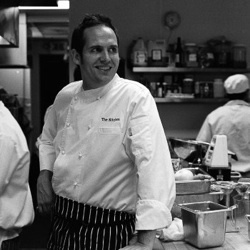 Chef Hugo Matheson refers to his restaurant, The Kitchen, as a community bistro and being a responsible member of the Boulder community is essential to chef Matheson’s philosophy. His restaurant is one hundred percent wind powered. Almost all of the leftover food, and even the wine, is either given to staff at the end of their shift, composted, or recycled. The majority of what they serve at The Kitchen is locally sourced and they have partnered with the non-profit group, The Growe Foundation, which educates local kids about the cycle of food, from planting seeds to harvest to the final product on the dinner table. Hugo Matheson graduated from Leith's School of Food and Wine. Soon after, he joined the acclaimed River Cafe, working alongside Ruth Rodgers, Rose Gray, and Jamie Oliver. In 2005, he opened The Kitchen in Boulder, Colorado. Q. For people visiting Boulder, please tell us about your restaurant? A. The Kitchen is Boulder’s community restaurant. In that we do our best to create an experience that is unique to Boulder. We do this in every aspect, from the warm, casual atmosphere that makes our restaurant a hub for the community, to our practices like working with local farmers to keep our product from Boulder as much as possible, and helping local schools to improve the food that kids eat. Q. Your restaurant is noted for being eco-friendly, what are the essential aspects of this? A. We like to think of this as just a part of being a community restaurant. We do everything possible, from using wind power for electricity, to having virtually no garbage (almost everything is either recycled or composted), to using recycled wood and materials for our furniture. Q. What are the greatest challenges of keeping eco-friendly? A. We don’t view it as a challenge. Like working with the local farmers, it’s an essential part of who we are. Q. You cooked at the renowned River Cafe in London, which has launched many famous careers. What is it about the experience that turns out some of the top cooks in the world? A. It was run as what I see as a real family restaurant, there always seemed to be a huge sense of community there. I went there to learn about front of house. Rose and Ruth inspired many people to search out the best produce and serve it in a very simple way, to me it always felt like the most wonderful place to be, and the passion was infectious. thinking about it they really changed the way I look at food and service. Q. What traditions from your own background are incorporated in your menu? A. Growing up in the English countryside, and the simplicity of the food my mother cooked, inspired me greatly. The Sunday roast, Shepherd's Pie, sauteed greens from the garden, great eggs, shooting, hunting, the quality and the realness that the ingredients had to them. Q. What purveyors inspire you and why? A. Anne Cure - she has a passion and drive that I envy and she is up for ideas that I have as well. Each year, she blames me for her getting involved and rearing pigs. But any farmer or producer who really cares for what they do and I know that it takes a certain person to do that, and I really thank them everyday. Q. What is your favorite thing to cook on your own menu? A. That is very much a mood thing at the moment - it would be sauteed greens. Q. What are some eco-friendly practices that you can share as advice for home cooks? A. Buy what you need, not what they want to sell you, and then really use the food that you buy! It might sound obvious, but we throw out a huge percentage of what we buy! Q. Who else in your field is doing interesting things that you think deserves more praise and why? A. The guys in the back cooking and sweating 14 hour days. They are like the farmers and the producers, the unsung heros of this industry. If it were not for them, none of this would be possible. Anybody who is cooking for the love of it, they are the people that I love. Q. Quintessential Colorado fare and what you like there? A. The person I think of is Lyle Davis. He runs a farm and a catering company, and he makes great chili with fried eggs. I do remember eating too much, God it was good! Q. Top five restaurants (other than your restaurant and regardless of cost, fancy or casual)? A. Frasca, Z Cuisine, Radda, El Ray, Chipotle -- they all have food that I want to eat. Q. For afternoon tea or a coffee and why? A. Spruce Confections, sit outside, look at the mountains, and eat a Raspberry Lorraine. A. The Squeaky Bean - it’s simple, well-cooked food, and run by somebody with passion. And it’s a great space. Q. Your favorite places to revisit when you go back to London? A. The streets just absorbing the life of a city, I will wander all day. Tea at Claridges is insane. Portobello Market, for used silverware, I always bring some back in my suitcase. Books for Cooks on Elgin Crescent. Details of Hugo Matheson’s recommendations on where to eat in Boulder, CO and London. Executive chef and owner of The Kitchen in Boulder, Colorado. Sustainability is key to chef Matheson’s restaurant. He doesn’t just talk about being eco-friendly, he practices it on a daily basis. Hugo Matheson’s recommendations on where to eat in Boulder, CO and London.